Research Control SRD991 top-mount valve positioner. 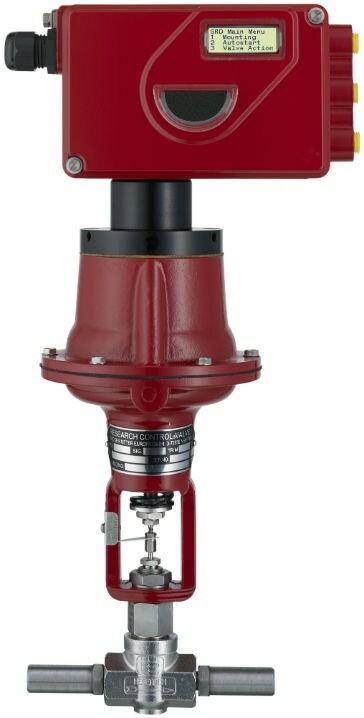 Badger Meter offers a new Research Control SRD991 top-mount valve positioner which mounts directly to the top of a control valve with a rugged linear potentiometer. While most valve positioners are side-mounted, the new top-mounted SRD991 uses a linear connection, which mitigates hysteresis between the positioner and actuator by feeding back the actual position of a valve actuator – faster, more accurate and more consistent than ever before. This provides significantly improved flow control. Top-mount valve positioners should be used when the application calls for high positioning accuracy or when greater force is required over the standard actuator, such as in the case of high shutoff pressures or excess packing friction. The SRD991 top-mount positioner is available with a large amount of benefits including a LCD screen, protocols (HART, PROFIBUS-PA and FOUNDATION Fieldbus H1) and two levels of diagnostics. All the diagnostics features can be easily configured and displayed by the positioner DTM. Moreover, the Positioner DTM enables a complete health report of the valve with full configuration and diagnostics data. The simple installation and setup of the SRD991 positioner allows an easy upgrade of any BLRA pneumatic positioner.